Spray 9x13 glass baking pan with cooking spray. Remove crusts from bread. Cut slices into 1-inch cubes. (Tip: An electric knife works well to cut bread without squishing it.) Place cubes loosely in bottom of prepared pan. Cut cream cheese into tiny bits. Sprinkle bits over bread. Top with blueberries. In large bowl, beat eggs. Whisk in milk and syrup, blending well. Pour egg mixture over bread mixture. Sprinkle lightly with salt and pepper. Cover with aluminum foil and refrigerate at least 8 hours, or overnight. Remove from refrigerator 30 minutes before baking. Preheat oven to 350° F. Bake, covered, for 30 minutes. Uncover and bake an additional 25-30 minutes, until golden brown and the center is set. 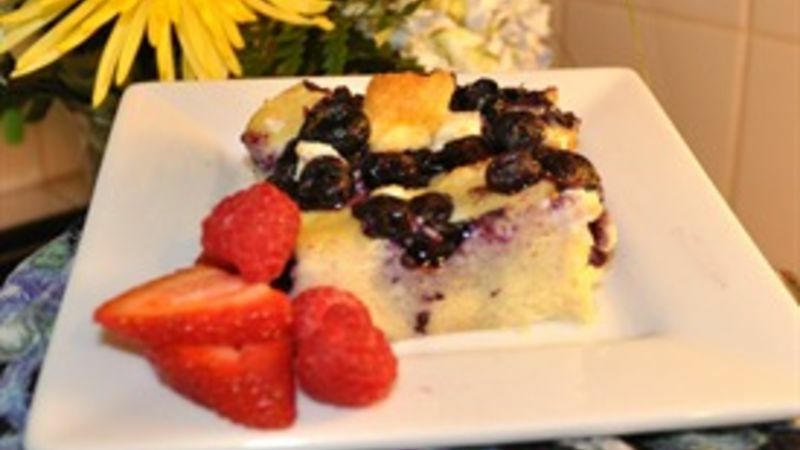 Allow to cool for 10 minutes to set, then serve with blueberry sauce (see below) and warm maple syrup on the side. Garnish with sliced fresh strawberries and whole fresh raspberries if desired.